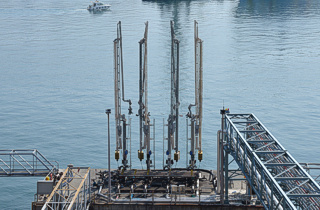 At present SAAR Depositi Portuali S.p.A has a modern and well equipped mooring dock for ships up to 180 m long, with 14 m of draught and 4 6" swinging loading arms, which can simultaneously unload 4 different products, with an unloading rate from 100 to 400 t/h, according to the ship pumping. 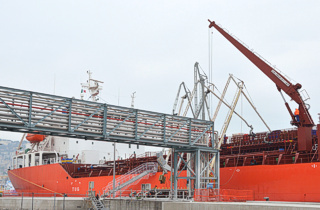 Moreover it has a second mooring with two unloading lines, for 120 m long ships, with 8.50 m draught, . This allows us to unload two ships at the same time.